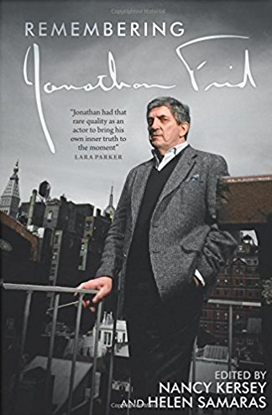 The Collinsport Historical Society: Jonathan Frid: "I’ve rarely had the opportunity to play myself"
Jonathan Frid: "I’ve rarely had the opportunity to play myself"
Jonathan Frid steps out of the dark shadows! 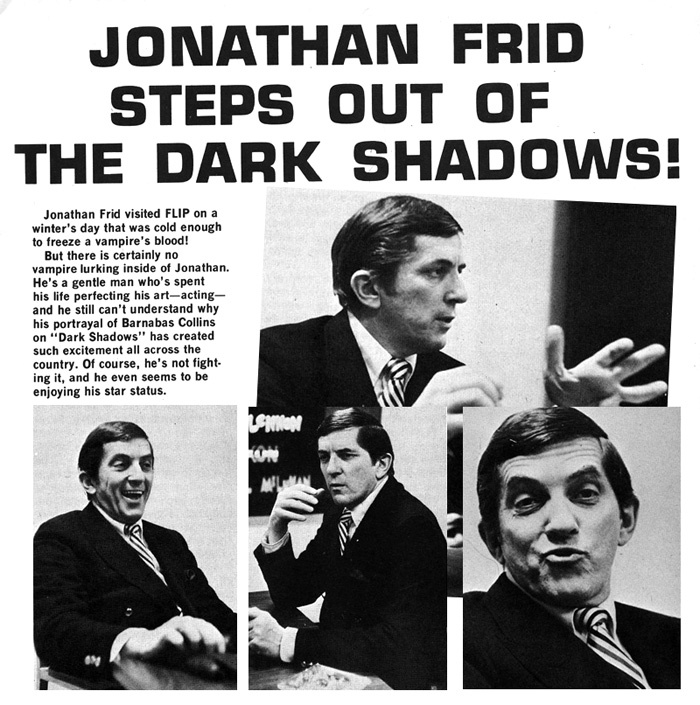 Jonathan Frid visited FLIP on a winter’s day that was cold enough to freeze a vampire’s blood! But there is certainly no vampire lurking inside of Jonathan. 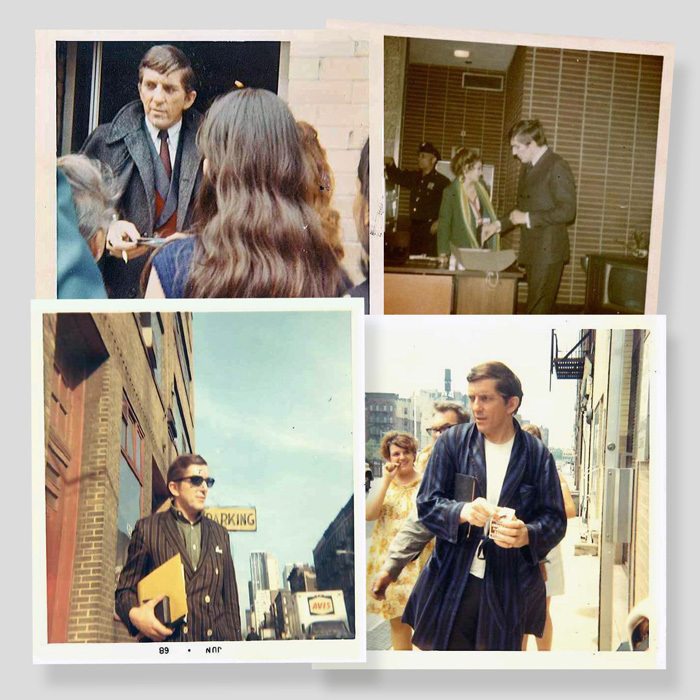 He’s a gentle man who’s spent his life perfecting his art — acting — and he still can’t understand why his portrayal of Barnabas Collins on “Dark Shadows” has created such excitement all across the country. Of course, he’s not fighting it, and he even seems to be enjoying his star status. Without his stage makeup, he’s not at all ominous looking — he’s really quite handsome — and he moves his hands expressively when he talks. This is what he had to say. FLIP: Even though your role in Dark Shadows is what first brought you national attention, you’ve been an actor all your life. How did you first get interested in acting and the theatre. JONATHAN: It was in prep school. Every year the six boys who were academically at the top of each class had to participate in the school play. I was never at the top academically, but I was interested and I volunteered to be in the play — which was an unheard of thing to do. The teacher in charge of dramatics was delighted to have a student interested in the play. I remember I played an old man. I was sixteen years old then, but all through my teens and twenties I found myself playing these character roles, people much older than myself. Now that I’m getting older, my parts have been getting younger, till we’ve just about met in the middle. Barnabas may be 175 years old, but I play him as a man my age. FLIP: Then you got into this pretty much on your own, without encouragement from your family. JONATHAN: Yes, but they didn’t discourage me, either, which was important. Especially with their strict Presbyterian background. My father was a building contractor, and he really loved his work. He had three sons and he wanted them to go into what would make them happy, too. FLIP: You’ve done a lot of Shakespeare over the years. What was your favorite role? JONATHAN: Richard III. There’s really a lot of humor in the part, which a lot Of people don’t realize. Except for the fact that he’s killing people, Richard does nothing but put people on the whole first part of the play. It was a challenge, because I feel there is still a lot of work to be done with Richard, when other actors play him. But I was lucky in having a director who Saw the character as I did. He helped me tremendously. FLIP: You were an “unknown” actor for many years, that is, a working actor without a national following. Was there ever a time when you felt you almost got a part that would have made you a star, or you just missed recognition in some other way? JONATHAN: No. 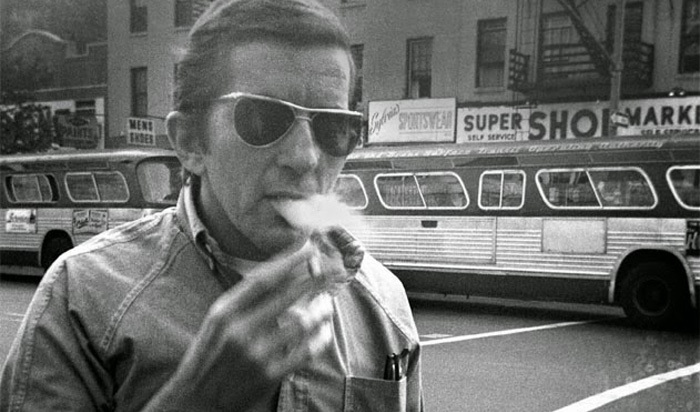 I suppose subconsciously every actor wants to be a star, but I never consciously worked at it. I got a lot of satisfaction out of many of my roles, but I never expected any of them to bring me stardom. 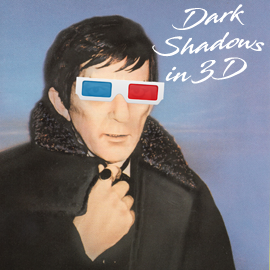 I certainly never expected that Barnabas would. 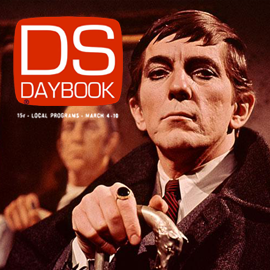 FLIP: You’re usually working from 8 a.m. to 6 p.m. on the Dark Shadows set. 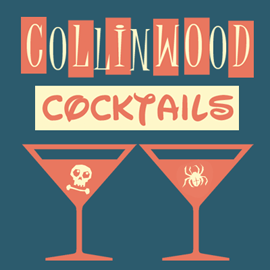 What’s happening in Collinwood this week to enable you to have this time off? JONATHAN: Actually, the writers just forgot to write me into the script! 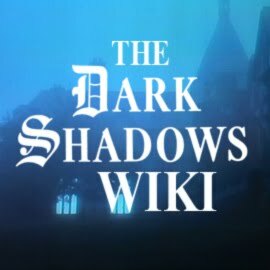 But we’re having Some trouble now with Barnabas and the series in general, and there’s been a lot Of rewriting, So I’m not on till the end of the week. FLIP: What sort Of trouble are you having? JONATHAN: We need new ideas for the story lines. So far, Dan Curtis, the producer, has been coming up with all the ideas. It’s really funny to watch him with the show’s writers. Dan has this miniature golf course set up in his office, and he goes swinging around it, thinking, and all of a sudden he’ll stop short and say, “I’ve got a great idea!” And out will come the idea for the next story. He’s just like a little kid about it, he gets so excited. But lately he hasn’t been able to think as quickly, So instead of having scripts two or three weeks in advance of taping dates, sometimes we’re only three days ahead. 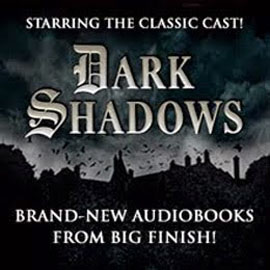 FLIP: But through all these problems, you’ve managed to give Barnabas a strong personality and even change his character from its early pure sinisterism to a more sympathetic interpretation. JONATHAN: On the contrary, Barnabas was much more sympathetic in the beginning, when I could portray his agony and remorse every time his need for blood compelled him to bite someone. He was “cured” of being a vampire six months ago, you know. So now he’s an ordinary mortal and not nearly so interesting or sympathetic a character as he was when he was a vampire. Now he just kind of hangs around. But in a sense, it’s interesting for me to play him as an ordinary man. I’ve done it before, too. In a flashback to the days before he was cursed, I played him as an 18th century gentleman! But, unlike most actors, I’ve rarely had the opportunity to play myself — to be a normal human being. 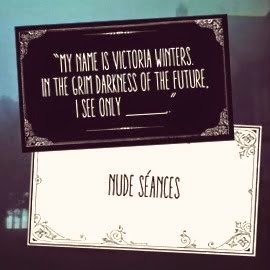 I’ve usually played parts that were mysterious or vaguely sinister. So it was fun for awhile, but now I wish they would decide what to do with Barnabas. Of course, Barnabas isn’t permanently cured. 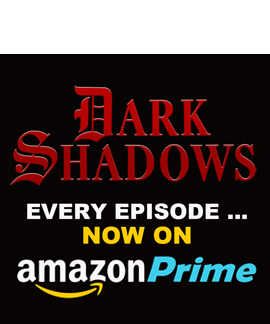 There’s a monster on the show, and if it dies, Barnabas will be forced to go back to being a vampire. And there are a couple of scenes each week in which the audience is given the uneasy feeling that he may be going back right then. FLIP: But there’s no immediate danger that Barnabas will be killed off, just because they can’t think what else to do with him. JONATHAN: No, I don’t think so. They’re playing around with a couple of ideas. 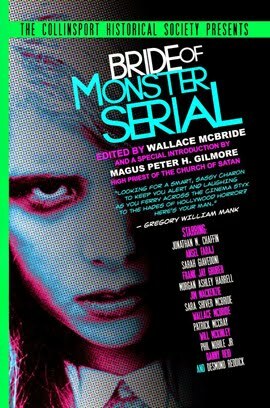 They may send Barnabas back into the past and then have the monster die. But then they’d have to send someone back after Barnabas to warn him not to come back! But nothing’s definite yet. FLIP: What sort of research did you do for the part? Did you read up on witchcraft and the like? JONATHAN: No. I don’t play Barnabas as a vampire, per se. He’s a man with a hangup. 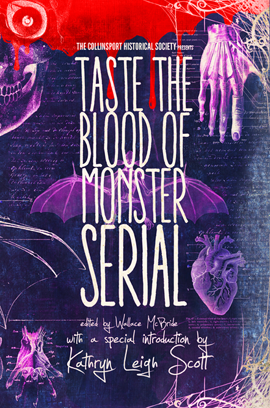 He has all the human characteristics and passions but his uncontrollable need for blood, human blood, makes him a monster. He must have it or he’ll die. But I myself have no interest in the occult, and I haven’t tried to make Barnabas true to form. In fact, I’ve probably broken every rule in the book. Historically, vampires were supposed to be bloodless, passionless creatures with absolutely no interests except getting blood. Bela Lugosi played them to perfection — I saw him a couple of months ago on the late, late show at about 3 in the morning. A vampire would go after its victim with a perfectly bland expression on its face. It felt no emotion and had no conscience. That’s what made the thought of a vampire so terrifying. FLIP: You’re evidently concerned about the show’s effect on teens, judging from the way you didn’t want FLIP’s last month’s cover, where you appeared, to be sadistic. fangs, except that that’s been so overdone. 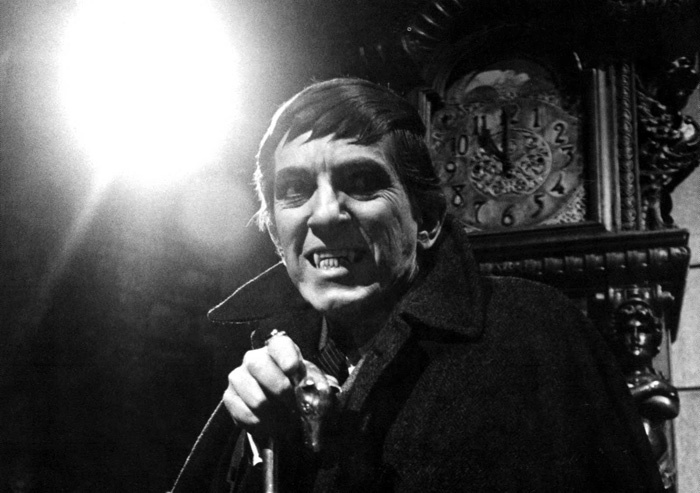 I think Barnabas should be more evil—he’s a more interesting character then. And as far as kids being impressed with the evil things Barnabas does, I just don’t think that’s a problem. Kids are pretty smart. They can watch Barnabas without applying it to their lives. They know Barnabas isn’t human. 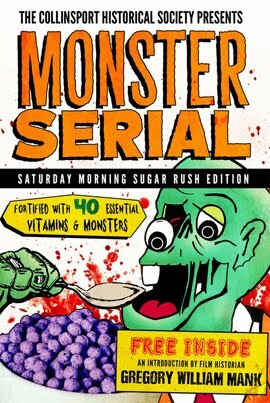 He looks like a man and talks like a man and has courtly manners, but he’s really a monster. And just as you wouldn’t bring a lion in the jungle to trial for killing another animal, you can’t judge Barnabas’ actions in human terms. 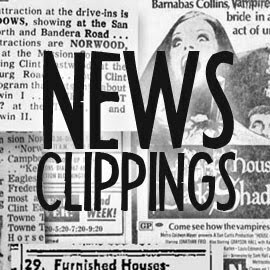 But it’s funny that all the magazine and newspaper publicity about Barnabas’ being a vampire has come out months after he stopped being one. And the fan mail peaked two months after he became normal. FLIP: How much fan mail do you receive now? JONATHAN: About 1,500 to 2,000 letters a week. FLIP: I know you try to answer as much as you can. How do you decide which letters require an answer? I don’t answer all the fan mail — the people who write me know that would be impossible. They’re just taking a chance that their letter will be one I do pick up. FLIP: Do you get much chance to meet your fans? around to the back, and when she saw me, boy did she bawl me out. She and her daughter had come all the way from Pittsburgh, or something, to see me, and here I was sneaking out. She was right, too. FLIP: Sometimes fame can be an inconvenience! JONATHAN: Yes, but I enjoy the recognition much more than I dislike the inconvenience. To give you an example: One afternoon when I wasn’t taping I was downtown doing some errands. I was due at the studio at 4 o’clock to block for the next day’s taping and I was late. So I grabbed a taxi and as we raced toward the studio I was thinking, here I am late, and I’ll still have to get through the crowd outside before I can get into the studio. Well, I arrived and there were only two girls standing outside and, boy, was I mad! FLIP: When you talk to fans, what do they ask you about most? JONATHAN: Mostly questions about the story line, what’s going to happen next. And then, who’s still upstairs in the studio. And my birthday was last week, so I’ve been getting a lot of questions about that. I don’t mind people knowing how old I am, but I don’t tell my birthday. But somehow they find it out, and my unlisted telephone number, as well. Kids are great detectives. But it’s the questions on the story line that I’m not too good at. I don’t read the scripts the days I’m not on the show, and the only time I watch the show is when I’m on, to criticize my own perform, So I don’t always know what’s going on at a given moment. And I’m such a slow study—I learn my lines so slowly—that the first year I was on the show I spent every minute either memorizing or performing. I was once on a TV talk show, and the moderator was asking me about the relationships of the characters to each other. He had a blackboard and a piece of chalk and he was actually drawing the whole family tree of Collinsport. I could hardly help him at all, but the studio audience kept calling out all the answers. They knew all the characters perfectly. 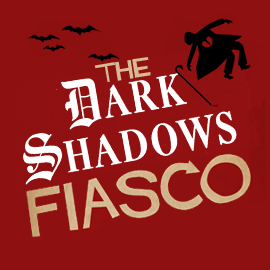 FLIP: After Dark Shadows you’ve said you’d like to teach drama at a university out West. Will you then stop acting? probably have to teach a textbook course on the history of drama, or something, and I was never a great student. And I’d have to teach about ten years before I was making as much money as I am right now. So that’s something to think about. But if I did teach, I wouldn’t act at the same time. Schools seem to like it if you do, but I had too many professors in school who wouldn’t show up for class half the time because they had a matinee, or something else to do. FLIP: Is there anything else you might like to do in the future? JONATHAN: Yes, a fad. Some of these soap operas run for years with the same characters, but we’re so far “in” this year that by next year we could be way, way “out” of it! And I hope that doesn’t happen.